For success in college, no skill is more critical than writing; it’s the very core of a student’s academic experience. Tested and trusted, A Canadian Writer’s Reference is an essential tool for students who are strengthening habits and skills that will support them throughout college. 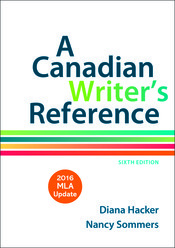 Adapted from the most widely used college handbook ever published—and with the help of several Canadian instructors — A Canadian Writer's Reference has advice that's easy to find and easy to understand. Grounded in Canadian texts, culture, and current events, examples throughout the book provide relevant context and advice for Canadian writers. And a new instructor's edition offers classroom activities and teaching tips for Canadian instructors—making it easier than ever to integrate the handbook into the course.